And voilà, here we are again. I went through my tie box and found this diamond-point tie I wore to some chorus show. 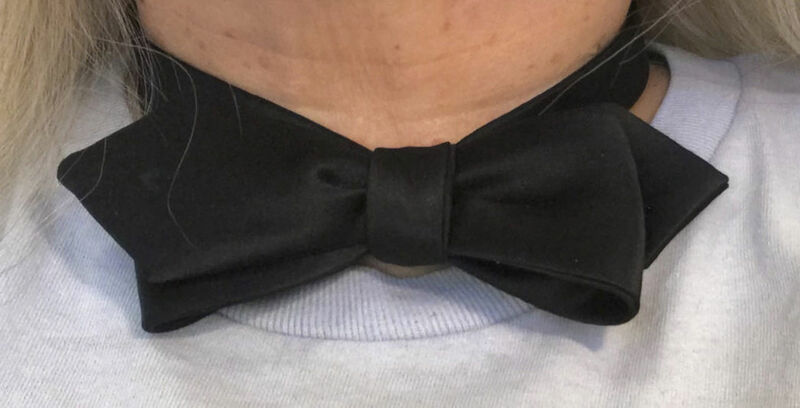 I was also tickled to see that I'd forgotten (having confused it with another floral tie) another one that never appeared here, coming along for a wedding between my look-at-these-bow-ties first days of learning to tie one and these later Bow Tie Tuesdays. I reckon you'll see it here soon. At a meeting this morning Norman commented on being disturbed by the asymmetry of the diamond-point type of tie (which he had not seen/known). In the overall effect you get a 2-D/flattened sort of visual horizontal symmetry, but it's not symmetrical by depth, if you will. I didn't tell him how much I related to what he was saying. Which is not inconsiderably. Still, it's a nice trick, what the ties do. So, what else is going on. We're interviewing for copy eds. Outdoor pools are closed. The "love train" adoptable puppy doggies wagon is a-comin' again this week. 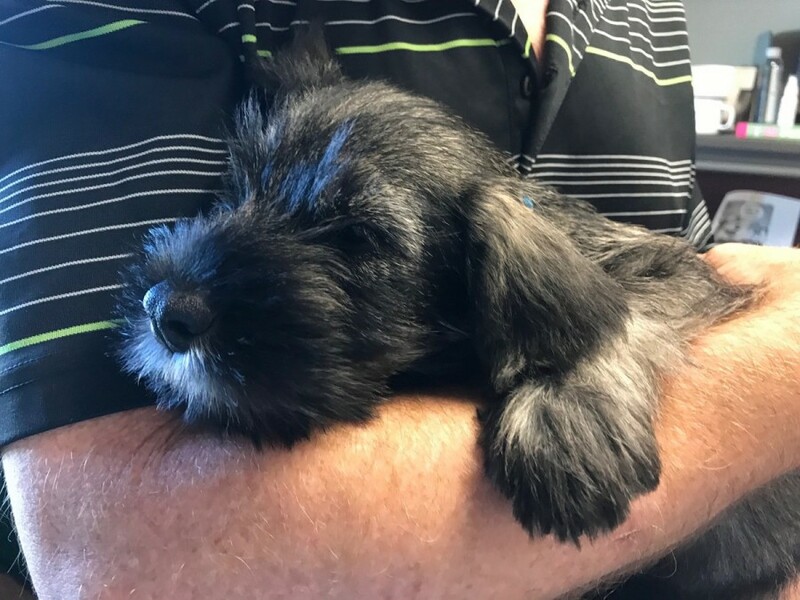 Today Alan had his new Schnauzer pup here at the office. You can imagine how that got me goin'. It's Noir City Detroit this coming weekend, plus one noir Friday night here in town with Eddie introducing it. Not sure how many of those I'm gonna be going to, but at least some. In addition to the intros, it really is cool to see them on film, on the big screen, and in an audience, even if it can be a little lonesome to be solo for film after film, with others in the crowd with pals. Not to mention it gets weirdly exhausting to see lotsa movies over a few days in a row, considering that you're mostly sitting in a chair. Speaking of chair sitting, I had the idea of checking out the community college gym last night, but ended up doing chair sitting instead, after just a brief walk down the street and back. I'll probably chair sit again tonight, after dinner-making. And I like the county rec center just fine, in its dingy everyperson glory. The community college's pools have salt water in them, and the non-lap one is warm. And it's all high-ceilings nice light, and the locker rooms are supposedly very nice, and they provide towels, when they're not out of them. I hear you can try it out on a try-it-out pass. I mean, a girl's gotta do something, unless she doesn't. There are things I was doing that I'm not doing. I could do other things. This is the writing of someone whose brain is slow, kinda spent, stuff like that. I have a lot to process from counseling. I think I'm doing that, under the surface. The surface, though, seems like maybe my blood sugar is low. Slept pretty well, two nights in a row, and still I'm tired. Or and so I'm tired? "The more you sleep, the more you wanna sleep," said Denise's mother. And then there was Craig Cornish, who said that sleeping an odd number of hours was more restful than sleeping an even number of hours. He was absolutely convinced. I don't really need to know why I want to sleep. But I wonder. I don't wanna be shutting down in some way that's not good for me. But then happy people probably just sleep when they want to. It's not like I'm sleeping for the future of humanity. Okay, you can see the not-Giant not-Mini (Just-Right) Schnauzer now, for making it all the way through this post.